France’s top internet regulator, Sébastien Soriano, has a message for Americans on net neutrality. I’m France’s top internet regulator. And I fear the FCC has not considered the full consequences of altering the open web. 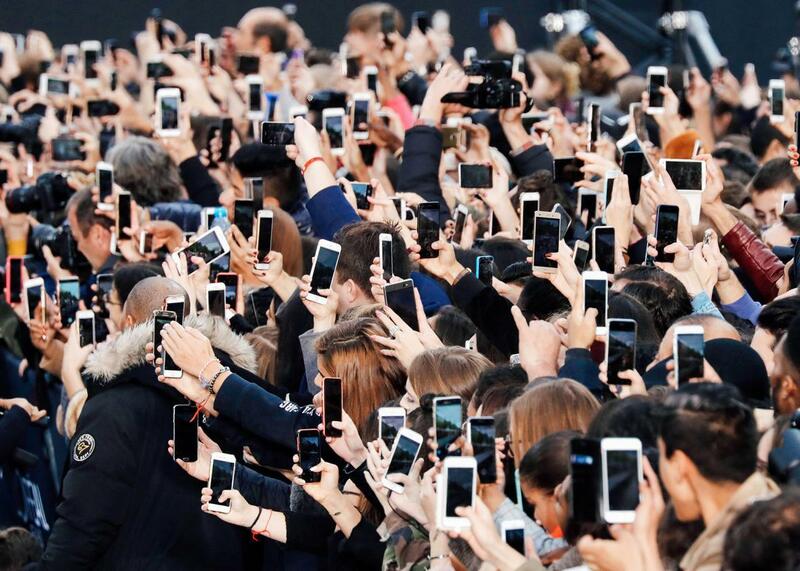 People use their smartphones to take photos of the L’Oreal fashion show on the Champs-Élysées as part of Paris Fashion Week on Oct. 1. Whether to retain or remove net neutrality protections in the United States, as the Federal Communications Commission will decide this Thursday, is an American question. But it’s good to know how it works in other democracies. As the chairman of both France’s regulatory agency for telecommunications and the Body of European Regulators for Electronic Communications, or BEREC, I believe it is my duty to share some evidence from Europe. In 2015, the European institutions adopted a law: the Open Internet regulation. This text basically prohibits discriminatory traffic management over the internet, sets transparency requirements, and puts commercial practices from internet service providers into a framework. In 2016, BEREC adopted guidelines providing a common interpretation of these rules for all European regulators. Since then, regulators have designed supervision tools, monitored markets, and prohibited several traffic-management practices but also let ISPs put in place some zero-rating offers and various innovations. This week, BEREC is issuing a comprehensive report on the implementation of net neutrality rules across Europe. What does it offer the United States? Net neutrality rules are not deterring telecommunications and cable companies from investing in networks. Critics of net neutrality argue that the rules discourage investment by internet companies. But there has been a 25 to 30 percent increase in investment in the French telecom market over the past three years, which include the adoption and implementation of the European net neutrality rules. While I wouldn’t go so far as to claim a causal relationship between the two, it is notable that investment has not declined or slowed. Investment in networks is a critical issue in the context of digitalization, and today Europe is very much focused on building out fiber and rolling out 5G data connections. My belief is that investments benefit firstly from legal certainty and the right incentives given to market players at the right time in the right place. In the end, as Europeans, we are lucky enough to have a clear and robust framework for telecom regulation from the late 1990s, which sets an efficient institutional setup: While elected bodies have laid down the principles and the priorities for internet policy, regulatory agencies have put them into practice with the necessary flexibility. Net neutrality is not about preserving internet as it is. It is about keeping doors open to reshuffle it again and again. Another point made by critics of net neutrality is that the internet developed just fine without open-internet protections in place. But it is not fair to argue that because the “internet as we know it” grew with no net neutrality rules, we do not need these rules today. Gutenberg did not benefit from any declaration of rights to invent the printing press. Nevertheless, we codified freedom of speech to keep using it. In today’s digital world, the main challenge is to make sure that startups, entrepreneurs, and all innovators still have the ability to reinvent our world. Big companies now in place—telecom, cable, media companies, tech giants—have been doing well in recent years, and the issue is not to fight against them. But we know from history that disruptive and game-changing ideas often come from the margins. More than ever, our duty is to give a chance to a future Magellan or Columbus to forge a way in the unknown. Some seem to forget the obstacles experienced by services like Skype less than a decade ago, struggling against blocking by major mobile network operators in Europe as in the United States, that wanted to preserve their own telecom revenues. What will happen tomorrow with the internet of things? With artificial intelligence? I am not anxious for internet giants. They will find a way, with or without net neutrality rules. They will manage to pay the tolls. I am talking about the other guy, the one we don’t know and who has a great idea. In this regard, having net neutrality rules in Europe is also a matter of attractiveness. The message is clear for all innovators: Come to Europe and focus on your ideas and your product. We’ll keep the way open for you. Net neutrality is a worldwide responsibility for democracies. Having net neutrality rules in one country creates benefits for all others—because innovators and people from all over the world will enjoy an open access to the end users of this country. That’s a common rule with networks: Openness generates value for everybody. The worldwide openness of the internet has been a great factor in its success, and it is now a global responsibility to preserve it. BEREC cooperates with many regulators around the world. Adoption of net neutrality rules is a strong tendency, as recently confirmed by India, the biggest democracy on Earth. The ways and means of net neutrality can differ from one country to the other, taking into account specificities of local markets and organizations. Because nobody has the truth, it’s good to look around. Whatever we do, we should be humble—and keep the doors open for the next generation of innovators.